How do I publish my IOS app? 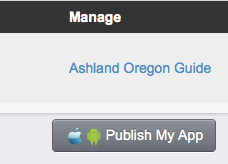 /Mobile Guides /How do I publish my IOS app? To Publish your IOS App Navigate to the App Dashboard. On the Lower Right Screen You can Click “Publish My App” this Will Take You to Another Page That Will Help get your app Published. How do I publish my Android app?